Most rolling backpacks are great, but there are also some that can't handle being used again and again. For some backpacks, the wheels fall of way to easy! To make sure you choose a quality backpack, you need to spend some time checking the different brands and models. 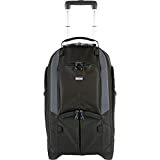 Having checked thousands of rolling backpack reviews, we can say that the Think Tank Streetwalker is the best choice for most people. The Think Tank Streetwalker got a rating of 4.25 out of 5, while the average rating in the list below is just 3.57. This is the best reviewed rolling backpack. We have checked 35,640 rolling backpack reviews, so we can show you the weighted average rating of all the bags. If the Think Tank Streetwalker isn't your style, you might also consider the Granite Gear Haulsted. The Haulsted is a close runner-up with a rating of 4.01 out of 5 - and it's usually cheaper than the Streetwalker. The second-best reviewed rolling backpack. Finally, you might consider the Jansport Driver. The Driver is the third-best rated rolling backpack with a rating of 3.73 - and it's usually cheaper than the Streetwalker. The third-best reviewed rolling backpack. Below is the list of all top 8 best rolling backpacks. Great if none of the three bags above are your style. PS: We have checked 35,640 reviews to make this top 8 list! Backpacks are meant to be hardwearing, load laden packs that can carry almost everything that you need. Of course, if you don’t want to shoulder all of that weight, you need to think about getting yourself a rolling backpack. It can offer you a lot of reprieve and make carrying all of that weight just a little bit easier. If you are not sure about how to go around finding a rolling backpack for yourself, you have come to the right place. Here, we take you through all of the options and features regarding this type of bag. This way, you will be much more at ease, finding a model that fits you well. Here is all that you need to know. If you are on the move a lot, whether for school or for work, it can often feel like you are carrying many of your belongings around with you, on your back. While this may mean that you are ready for practically any situation, the downside is that you also have to lug around a considerable weight. This issue is precisely why you may need a rolling backpack in your life. While you may be more familiar with kids rolling backpack, it is now becoming fairly commonplace for adults to take such packs around with them as well. Here is a comprehensive guide to everything that you need to be aware of rolling backpacks. As you can imagine, the main advantage of a rolling backpack is that it makes it a lot easier to carry a heavy load. However, what you may not know is just how much of a benefit it can be to you. There are actually thousands of backpack-related injuries reported every year, mostly due to carrying a far heavier load than possible. Although these are largely among school children, adults too, are at a similar risk of developing such issues. With rolling backpacks, you don’t have to cut down on how much that you carry, instead simply being able to pull instead of carrying your pack everywhere. That is not so that there aren’t minor disadvantages associated with rolling backpacks either. The only real problem arises if you ever have a need to carry or haul around your backpack. This is while these bags are able to store greater weights, they are also heavier by themselves. As such, they can be quite difficult to lug around with you, if there is no chance of rolling them around. School Backpacks: These are available in small, medium, and large sizes. The smallest of the backpacks are usually targeted towards kids in kindergarten and are often quite lightweight. The bigger bags are usually a bit sturdier and have more organization features. Travel Backpacks: These type of backpacks are quite durable and are meant to be taken as carry-on luggage on an airplane. These can range in size from medium to large and are often able to hold quite a bit. Laptop Backpacks: As the name suggests, these backpacks are predominantly meant for laptops. They have sleeves or compartments specifically for laptops and often have a little more padding for protection purposes. With school kids, it is all about keeping the weight as low as possible. This is so that children are able to pick up their packs and carry them around with minimal assistance. One of the main factors with these type of backpacks is compartments and pockets that make organization easier. While it may not be required, it can be helpful to have wheeled backpacks for school that are water resistant to keep belongings safe and dry. Now, with travel rolling backpacks, there may be some size restrictions that you have to adhere to. Depending on whether you are on a domestic or international flight, your backpack will have to be of a specific length. Often, these type of rolling backpacks can’t be any longer than 22 inches. They also have a larger number of compartments and can store a greater number of items. Most rolling laptop backpacks are either for work purposes or business trips. Due to this, they aren’t typically too large, although there is enough space for a laptop and some documents. It is important to check that the compartment or sleeve that is meant for the device is compatible with the screen size of the laptop. When you are comparing rolling backpacks, it can be helpful to know the features that will be most beneficial to you. A water resistant backpack is one that will prevent the water from seeping through, at least for a short period of time. While it can’t withstand downpours, a water resistant pack can help to protect your belongings in the event of a spill or a drizzle. There are two main ways that a bag can be considered water resistant. The first is where the entire backpack is made from a material that either has a repellent coating or has water resistant properties. The other option is to choose a rolling backpack that has a water resistant compartment where important documents or devices can be stored for protection. One of the features that can be found on travel wheeled backpacks especially is the ability to separate the backpack from its wheels and handles arrangement. This allows you to carry your backpack around like a traditional model, making these type of backpacks quite light. This is a good option for anyone who only wants a rolling backpack for a small part of the journey but wants a regular backpack for the rest of the time. The rolling system of a wheeled backpack consists of the telescopic handle and the wheels. It is important to inspect these aspects as they will determine just how useful your rolling backpack actually is. First and foremost, the handle should seem durable enough to withstand the weight of the pack and the items inside. It should also be able to contract and expand smoothly and withstand continuous and frequent use. The wheels, as you can imagine, are quite important too. It is typically best to choose rolling backpacks that have larger wheels. Wheels with a greater diameter are unlikely to get stuck in smaller ruts or cracks and will go over surfaces more smoothly. You will also need durable wheels that can easily handle uneven terrain without cracking or splintering. Rolling backpacks typically only have two wheels at the back. Some have two plastic knobs in the front, which help to stabilize the bag and keep it off the ground. If you want to stop your pack from falling over and want to minimize the wear and tear that it has to withstand, this can be a good feature to look for as well. The suspension systems on most rolling backpacks consist of the shoulder straps and sometimes, a sternum strap. With wheeled backpacks, you have a few options when it comes to the shoulder straps. Some are attached to the backpack while others can be removed or tucked away when you don’t need them. While the detachable straps do make it easier to cart around your backpack, it is not so easy for you to suddenly convert it from a rolling backpack to a carrying one. Regardless, you should look for shoulder straps that are at least slightly padded. These sit more comfortable on your shoulders and prevent the straps from digging into your skin. This type of strap is especially handy with heavier loads. With traveling backpacks, it can be a good idea to consider a backpack with additional handles, perhaps on the top or the sides. This makes it easier to carry, lift, and deposit the bags as needed, particularly if you don’t want to carry the backpack on your shoulders. Although not strictly a part of the suspension system, you should pay attention to the back of the bag when choosing it. Since the carrying frame is most obvious here, you should go for a bag that has a little bit of padding in this region. This will make it more comfortable to carry on your back. At the same time, look for a lightweight material, such as mesh, so that the air circulation is a little better and you won’t feel as hot while carrying it. If you want to carry a larger number of items with you, then you may want to look into expansion features. This will allow you to increase the internal capacity of the backpack so that you can store a greater number of items. It is usually a good feature to have with either school bags for children in higher grades and with more books. It can also be found on rolling travel backpacks as well. Of course, compression straps can also be quite useful with a wheeled backpack. These straps can help to contract the bag so that the items inside will be held in place. This will result in less of a mess and can even help to protect certain things. Compression straps can also work to make a backpack more compact which is a handy feature to have if you traveling and need the pack to fit in the overhead compartment. These are all of the details and features that you need to pay attention to while choosing a rolling backpack for yourself. Classic rolling backpacks and models that haven't yet got enough reviews to be ranked. List ID 83. Images from Amazon Product Advertising API and shop datafeeds.